After working so hard during the day, it is right to reward yourself with a great bed that can help you to achieve a good night’s sleep. Some beds can cause backaches, discomfort, and even spine problems. Platform beds nowadays are becoming more popular with modern enthusiasts because of the comfort and aesthetics that they can provide. So, we’ve come up with a list of the top 10 best bed platforms that you can buy in the market today. 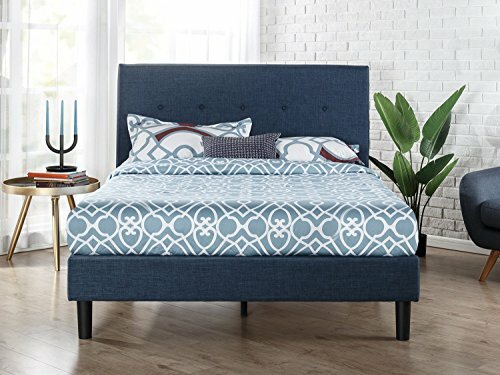 The following platform beds are the most stylish, unique-looking, and durable models we’ve reviewed just for you. Let’s see what’s in store for you. This masterpiece that can provide years of comfort is from the Zinus. Featuring the classic bed style and sturdy wood slat that supports less than three inches of slat spacing. It has soft button tufted dark grey upholstery to provide optimal comfort. Upon arrival, you are required to do a little assembly of this bed. You can locate all the parts that you’re going to need for the assembly at the zippered compartment. Frame and wood slats are all included. Foam padded tape is added to the steel so that it doesn’t squeak or make any noise especially if you have kids sleeping in the bed. This model is available in twin, full, queen, and king sizes. Buyers can enjoy up to five-year limited warranty upon purchasing the product. Now you can transform your bedroom thanks to this modern-looking bed platform. 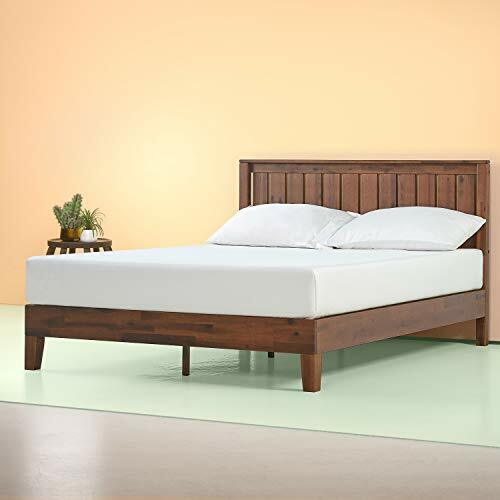 Another product from Zinus is the upholstered square stitched platform bed with wooden slats. 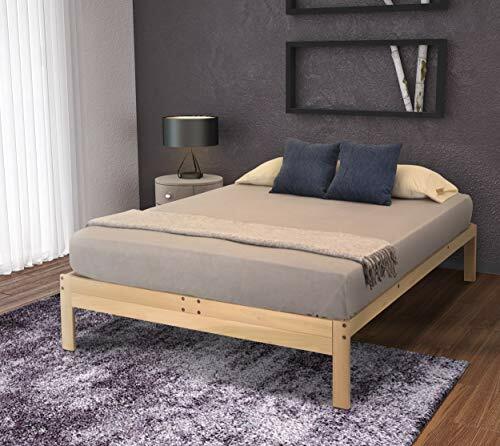 Similar to the previous product that we’ve reviewed, it also features a classic bed style and provides sturdy mattress support. The dark grey upholstery will look good in any modern house. Sturdy wood slats and steel frames can last for a long time. The zippered compartment contains all the needed parts for the assembly. There are ten wood slats and frame included in the package. The foam padded tape is added to the steel frame to minimize the noise that it generates. It’s a great bed for those who have hyperactive kids even when sleeping. Buyers can enjoy up to five-year limited warranty upon purchasing this product. Zinus provides strong support for a good night’s sleep. Zinus is known for manufacturing quality bed frames among other home furniture, and this one is not an exception. This easy-to-assemble bed with no box spring needed is perfect for people who want a no-nonsense bed platform. The 37-inch high wood-paneled headboard provides optimal comfort when sleeping. To increase the service life of the mattress, a sturdy wood slat mattress support is included. Similar to their other products, there is also a foam padded tape added to the steel frame. In that way, you can generate the noise and squeaky sounds even if your kids are playing on the bed. The non-slip tape on the wooden slats will also prevent the mattress from moving. This espresso wood frame will look great in any modern living room. Center support legs are also present. Buyers can enjoy up to five-year limited warranty upon purchasing the product. 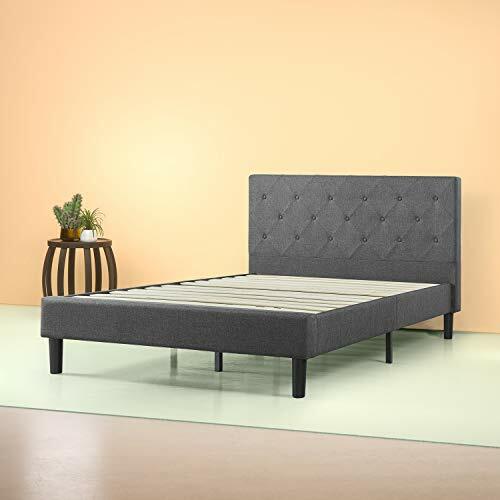 If you’ve enjoyed Zinus‘ bed platform products, you will also love this diamond stitched platform bed in dark grey. The classic styling and strong closely spaced wood slat support provide optimal comfort. It also features a dark grey upholstery with diamond stitching. Frames are purposefully made 1 inch short in length and width. This is designed to help you prevent your toes from hitting the end of the hard frames and causing terrible pain. The package includes a headboard, frame, and wood slats. You can also buy a mattress from the same manufacturer. Minimal assembly is required before you can use the product. All the materials can be found in the zippered compartment at the back of the headboard. Buyers can enjoy up to 5-year limited warranty upon purchasing this product. 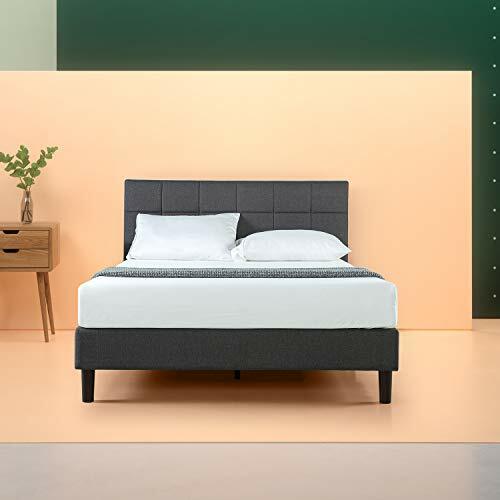 The Zinus upholstered button tufted platform bed with wooden slates is perfect for any modern enthusiasts out there. This wooden slats with steel frames provide excellent stability and optimal comfort when you are sleeping. The fabric is made of knitted polyester, so rest assured that it wouldn’t cause any allergy or itch your skin in the process. It’s also friendly to children’s delicate skin. All the materials including the footboard, frame, legs, and wooden slats are located at the zippered compartment at the back of the headboard. To ensure that the mattress will fit properly, you can also buy from the same manufacturer. It’s an excellent choice especially if you still don’t have a mattress as of the moment. For noise-free use, the manufacturer added a foam padded tape to the steel frame. Buyers can enjoy up to 5-year limited warranty upon purchasing the product. 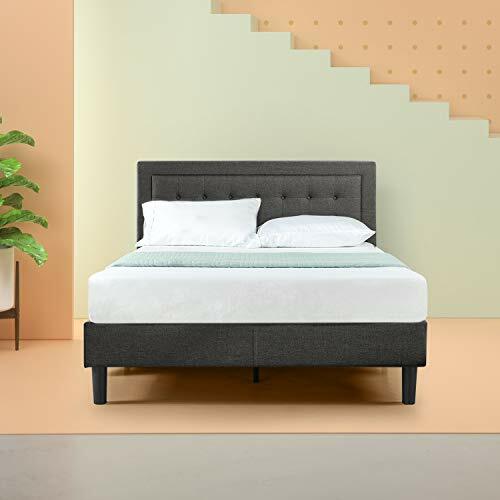 This is going to be the last bed platform we’re going to review from Zinus—the button detailed bed platform in navy blue color. Similar to the previous models, it features a classic bed style with navy upholstery to match your modern living room. The package includes a headboard, frame, and wood slats. All you need to do is assemble it, and it’s ready to use. There is a zippered compartment in the headboard where you could find all the parts that you’re going to need for the assembly. The noise-free bed is very convenient thanks to the foam padded tape that’s added to the steel frame. This model is available in twin, full, queen, and king size. All buyers can benefit from its 5-year limited warranty upon purchasing the product. Check out this bed platform from South Shores! This minimalist designed bed is perfect for any modern bedroom. The sleek-looking bed is available in pure black, adding a neutral piece to your room. We also like its hidden storage that will allow you to store your things thanks to its two large drawers with metal handles. It’s an ideal option for homeowners who do not have the luxury of space for a large bed. It’s also an economic choice because you don’t need to burn a hole in your pocket by buying a box spring for your mattress. Rest assured that with proper use and maintenance, this bed can last for a long time thanks to its laminated parts and a top surface. Buyers can enjoy up to five-year limited warranty upon purchasing the product. 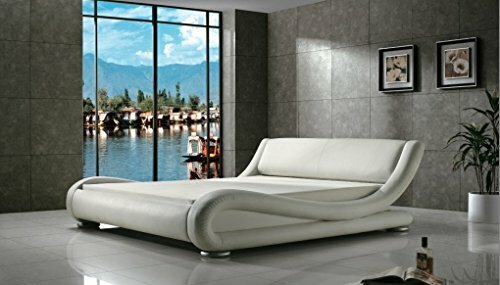 Add a hint of modernity and sophistication to your room with this contemporary vinyl platform bed. Its unique curve design sideboard is one of the unique-looking models we have found so far in the market. 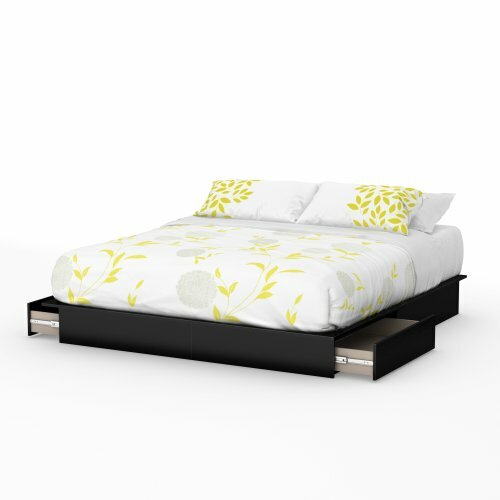 This modern-looking platform bed is perfect for any contemporary or transitional styled houses and condos. The package includes 12 pieces of curved euro slats with no foundation needed. It requires minimal assembly upon purchasing the product. The bed is covered with high-quality vinyl, so rest assured that it can last for a long time with proper use and maintenance. It’s the perfect bed for those who are suffering from backaches and other spine problems because of its curved design that can curve and relax your body. Now you can have a good night’s sleep thanks to this bed platform by Greatime. Why not renovate your home this year with this Prepac bed platform? It features six drawers for added storage, an ideal option for homeowners who have limited space in their house or apartments. Three drawers are located on each side of the bed, an ideal space for your clothes, linen, and even shoes. The solid drawers even feature an all-metal roller glider that allows you to have a smooth and safe operation when trying to access the things that you’re going to need for the day. This bed is constructed with high-quality laminated composite wood that’s easy to assemble upon arrival. Lastly, we have a bed platform from the World of Futons. It is made of 100% solid kiln-dried hardwood construction that can last for a long time with proper use and maintenance. This unfinished bed platform allows you to beautify the bed according to your style and preference. It’s chemical free and does not pose a threat to the health of your family members. There will be no chemical smell when this product is assembled. You don’t need a box spring for this product anymore. 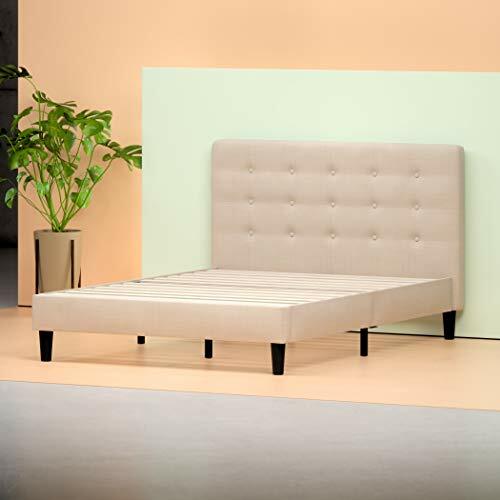 Constructed with top-grade materials, even heavyweight users can enjoy this bed platform. It can also fit any standard-sized mattresses, allowing you to make the most out of it after the assembly. Buyers can enjoy up to 5-year limited manufacturer’s warranty upon purchasing the product.